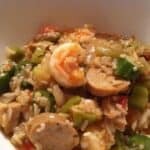 Chicken Sausage Jambalaya with Shrimp has lots of great Cajun flavor with less calories than a version with pork sausage. In a large pot, heat 1 tablespoon oil over high heat. Add sausage and cook until lightly browned. Remove from pot and set aside. Slice sausages diagonally when they have cooled. Add remaining oil, celery, bell pepper, onion and garlic. Cook until softened, about 5 minutes. Stir in tomatoes, broth, water, rice, thyme, salt and cayenne. Bring to a boil, cover and simmer 35 minutes, stirring now and then. Add frozen okra and reserved sausage. Cook on medium heat, uncovered, stirring frequently, until rice is tender, 10 to 15 minutes. Add shrimp and continue cooking until heated through, about 10 minutes for shrimp that are not frozen; add 5 minutes if you are using frozen, pre-cooked shrimp. Scoop some jambalaya into bowls after the shrimp is heated through, and you are ready to enjoy!